How could an off-duty police officer possibly stand a chance against a gang of professional terrorists? Well, he does. As a group of German terrorists take over a large corporate building, New York cop John McClane must find a way to stop them without being discovered. The hero, John McClane, is a rogue cop who when not abiding to police rules replies, “Yeah, that’s what my captain keeps telling me.” This maverick character is amusing and boisterous and is a huge strength to the franchise, but despite this hard man exterior, one of McClane’s main goals is to save his broken marriage and his wife, who is held hostage by the villain. This adds a much needed engaging side to an otherwise violence driven off-duty cop. His undeniable commitment to the cause is displayed in scenes where he jumps around with glass in his feet and when he stalks his enemies on top of moving lifts; all of this rounds up to deliver McClane as a great unstoppable force, while adding to the overall flavour of the film. Even for an all out American action flick, Paul Gleason’s Deputy Chief of Police is one of the worst cop characters to hit the screen. His continuous lack of competence is incredibly irritating, ignoring any advice provided by the other police officers and arguing constantly with our hero, McClane. However having such an incompetent cop does ensure McClane’s reckless actions appear heroic and correct compared to the Deputy Chief of Police’s continual underestimation of the villains. As a counter to these police officers, Rickman’s villain role is one of the level setters for movie bad guys, playing a slightly sadistic, yet highly intelligent, German terrorist. Throughout the majority of the movie, his henchmen are no match for John McClane, as he picks them off one at a time; however when confronted face to face, the main villain deceivingly plays a great fake hostage, matching McClane’s brawn with brain. This switch in character specifically displays Rickman’s brilliant acting talent – another fantastic role for the great English actor. 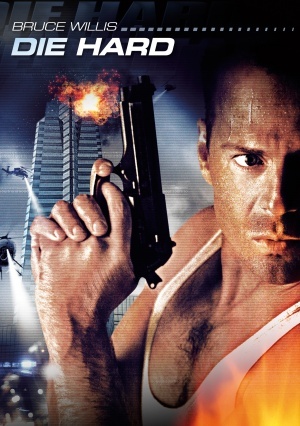 Die Hard was a new and original action film on its release in 1988 and has stood the test of time remarkably well. Despite some annoying characters, our protagonist and antagonist hold their own, creating an enjoyable action film with some great, memorable action scenes.